Turkish police detained three Russian citizens with suspected connections to ISIS this week as part of a nationwide security sweep following a suicide bombing on Tuesday. Eleven people, including the bomber, were killed in that incident, and 17 more were wounded. The attack, which appeared to target foreigners, took place in Istanbul’s historic Sultanahmet Square. The Russian consul general in Antalya, Turkey, confirmed that three Russians had been detained. A source in the Russian security services told the TASS news agency that all three suspects, whose names have not been released, "had links or participated in foreign terror groups." Turkish police said that documents, CDs, and other items were seized in the raid. In a press conference after the arrests, Turkish Prime Minister Ahmet Davutoglu said "secret actors" were behind the Istanbul attack. He went on to say that "certain foreign powers have an obstructing stance against Turkey's airstrikes on Daesh targets," implying that Russia has been protecting ISIS fighters in Syria. "Turkey will retaliate in whatever form it deems necessary against anyone who attacks the country," Davutoglu said. Turkish President Recep Tayyip Erdogan in September attended the opening of a new "grand mosque" in Moscow, seeming to herald increased Turkish-Russian cooperation in countering Islamic extremism. But relations between the two nations soured quickly. In November, following numerous violations of Turkish airspace by Russian planes in the preceding weeks, the Turkish air force shot down a Russian fighter jet near the Turkish-Syrian border. Turkey, a NATO member, insists that the Russian plane had violated its airspace and ignored repeated warnings. Russia insists its plane was downed in Syrian airspace. One Russian pilot died. In retaliation, Russia has banned some Turkish goods, suspended visa-free travel, and cut off charter flights to Turkey. The FSB has raided Turkish banks in Moscow. Turkish construction companies have also been banned from Russia, and some Turkish businessmen and visitors have been expelled. Since the incident, Russia and Turkey have traded accusations about support for ISIS or using the fight against ISIS to cover other regional ambitions. Russia has been getting the upper hand in the information war. Recent analysis of Russian state media shows that Turkey now tops the list of countries cited as "enemies" of Russia, supplanting Ukraine/"the Ukrainian fascist junta" and ISIS. Russian state media has devoted considerable bandwidth to portraying Turkey as materially aiding ISIS, including accusations that the Turkish government has helped ISIS sell its oil. President Vladimir Putin’s accusation of Turkish involvement in oil smuggling was quickly followed by supposed documentation released by Russian officials to Russian state media, including RT and Sputnik, and then rapidly echoed by "independent research" groups often cited by Russian state media, including the Center for Research on Globalization. Syrian and Iranian officials have also supported these claims. 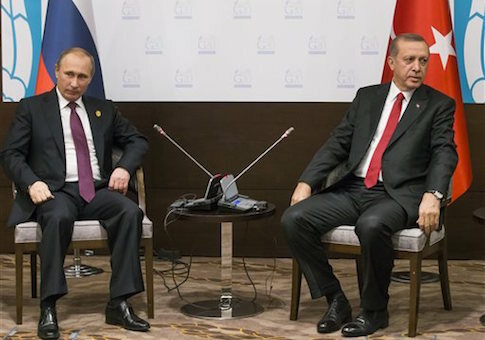 Turkey in turn accused Russia of profiting from ISIS’s oil. The U.S. Treasury Department in November issued sanctions against individuals and entities "providing support to the Government of Syria, including for facilitating Syrian Government oil purchases from ISIL," an alternative acronym for ISIS. Three of the sanctioned individuals and two of the businesses were based in Russia or had Russian connections. One Syrian, George Haswani, who had been granted Russian citizenship, was labeled as "middleman for oil purchases by the Syrian regime from ISIL." One was Russian "businessman" and longtime World Chess Federation (FIDE) President Kirsan Ilyumzhinov, who was sanctioned "for materially assisting and acting for or on behalf of the Government of Syria, Central Bank of Syria," and others. Ilyumzhinov is close to Putin, and has acted as Putin’s emissary to Saddam Hussein, Moammar Gaddafi, and Bashar al-Assad. Ilyumzhinov "temporarily relieved himself of his functions" as FIDE president after being sanctioned. Russia previously accused the Kurdistan Regional Government in northern Iraq of selling oil from ISIS. U.S. experts have said that ISIS has been effective in co-opting smuggling routes established by former Iraqi leader Saddam Hussein. Some of these routes run across the Turkish border. U.S. Treasury officials have said they are aware of the illicit trade across the Turkish border, but the U.S. State Department has said that accusations of "collusion by the Turkish Government with ISIL for … oil smuggling or consumption" are "a baseless falsehood that was propagated about the Turkish Government." Russian state media has also started spreading accusations that "Turkish labs" are refining "ISIS heroin" for sale abroad. In December, Turkey was the target of massive cyberattacks, which hacker collective Anonymous claimed credit for, citing claims about Erdogan’s support for ISIS as the cause of the attack. Turkey initially blamed Russia for the attacks; analysis of the attack has shown it was conducted not by the Anonymous collective but a single hacker. The hacker cited "news, documents, and claims that the Turkish government—and Turkish President Recep Tayyip Erdoğan specifically—were helping ISIS" as the reason for his offensive. After the attack, a spokesman for Russia’s Ministry of Internal Affairs said hacker groups in Russia had close relationships with the security services and/or are controlled by them, and that the Interior Ministry was considering (classified) ways to incorporate hacker groups to fight terrorism. Turkish hackers hijacked the Instagram account of a Russian minister in retaliation for the crippling attack. In his annual address to Russia’s Federal Assembly on Dec. 3, Putin said: "We remember that the militants who operated in the North Caucasus in the 1990s and 2000s found refuge and received moral and material assistance in Turkey. We still find them there." Turkish claims of Russian collaboration with ISIS may not be backed by a slick media operation, but there are other voices making this argument, as well. In December, the chief of staff of the Free Syrian Army, Major General Khalid Ahmed Birri, gave an interview to a Turkish news agency saying the FSA had intercepted conversations between Russian and ISIS commanders coordinating attacks on Syrian rebels. "Russia is cooperating with both [Assad’s] regime and Daesh," Birri said, using an alternate name for ISIS. "Russia’s goal is not to fight terrorism." A Ukrainian TV station recently aired an interview with a man claiming to be a defector from Russia’s Federal Security Service, in which he alleged that Russia recruits for terrorist networks, including ISIS and is involved in planning attacks against Western nations. The Turkish-Russian information war is a major complication for efforts to battle ISIS. While President Obama used his final State of the Union address to insist ISIS "[does] not threaten our national existence," three former Obama administration officials gave a bleak assessment of ISIS’s prospects at hearing this week before the House Armed Services Committee. "ISIS poses a significant strategic and lethal threat to the United States of America," said Michael Morell, former acting director of the Central Intelligence Agency. "As a terrorist group, ISIS poses a threat to the U.S. homeland." This entry was posted in National Security and tagged ISIS, Recep Tayyip Erdogan, Russia, Turkey, Vladimir Putin. Bookmark the permalink.